We planned to spend our first night in Pueblo, a steel town which is also a major railway junction some 115 miles south of Denver. The two towns are linked by the UP/BNSF Joint Line, which dates back to WW1 when the USRA took the opportunity to create a double track railway, routing northbound traffic over the D&RGW whilst southbound trains rode the AT&SF. Today it remains a busy railroad with upwards of 20 trains a day, although at present many run at night due to ongoing signalling work during daylight hours. 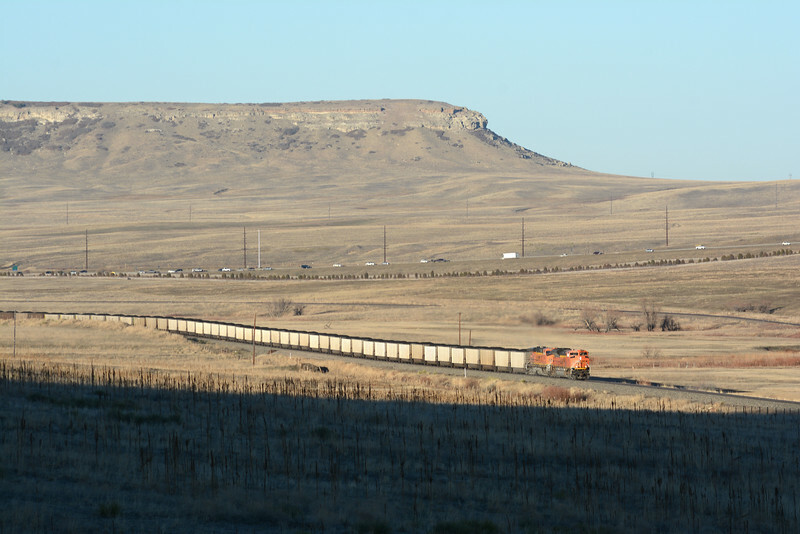 As we drove south from Denver we saw a southbound coal train making its way slowly through Castle Rock. We drove on to Palmer Lake hoping to catch it before the light failed, it eventually appeared south of Larkspur. As you can see the shadows are rapidly lengthening.